All glassware goes through a rigorous cleaning process which has to pass our strict quality control procedure. Each glass is finished with a hand polish by one of our glassware team members. We guarantee your glassware will be sparkling and ready for use upon arrival. You will find lots of options here! 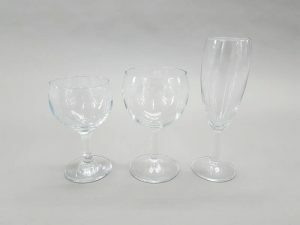 Orchestra Glassware: Our orchestra crystal cut glassware is ideal for a special event or intimate dinner parties. 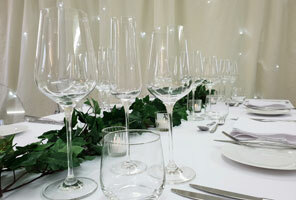 Ivento Glassware: Made from tritan crystal this glassware will add touch of elegance to your event! 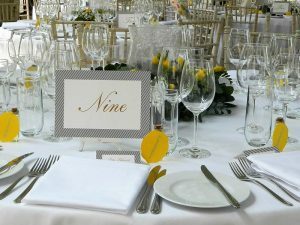 Lyric Glassware: Our most popular glassware range is ideal for weddings and celebrations, giving your function the sparkle it deserves! 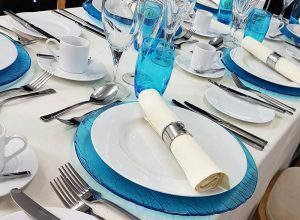 Coloured Glassware: We have a variety of specialist coloured glassware for you, this really can transform the look of your function. 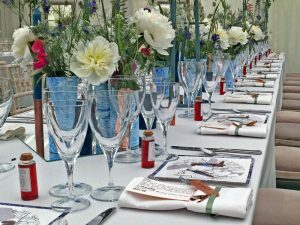 Plain Glassware: A great option for informal gatherings or large events. Claro Glassware: This tall crystal glassware makes a statement for those special events! Here we have 6 ranges for you to view. From our crystal glassware through to our cheap and cheer plain glass range, we have something for everyone! Not forgetting our popular coloured glassware range where you can also find a good selction of charger plates.